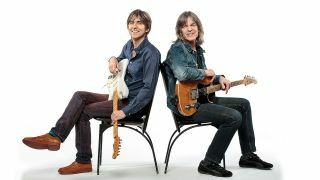 Not many people would have predicted a collaboration between Eric Johnson and Mike Stern, much less a whole album of it in this year's Eclectic, but these diverse players have plenty of common ground. They were both heavily influenced by Hendrix, Beck and Wes Montgomery at an early age, blending these influences into their early fusion styles... Eric with the Electromagnets and Mike with Billy Cobham. "There's a big difference between Johnson's elegant balance and Stern's ferocious bop- blues"
You can hear both the common ground and the huge diversity on the album Eclectic, so here we're going to look at some of the key aspects of each player's style. Tonally, they both like a meaty overdriven tone, but their clean sounds couldn't be more different. Compare Johnson's crystal Strat tones with Stern's neck humbucker and slightly detuned pitch-shifter effect. Technically, both like to pick most notes rather than using legato, but there's a big difference between Johnson's elegant balance and Stern's ferocious bop- blues. Here are six short examples - three in each player's style, starting with Stern - to give you a taste. Mike Stern started out as a blues and rock player, and this is still clearly audible in his jazz and fusion playing. He has made use of plenty of funky bluesy riffs such as this one, and all three of our Stern-style examples fit this flexible E7 tonality. This lead line starts in a general hybrid Dorian/Mixolydian shape, but look what happens in bar 3 - there's a chromatic descent, a one-fret slide and then we're using the half-whole diminished scale (E F G G# A# B C# D), a favourite of Mike's. Going back a long way, here's a pattern-based lick a bit like the way he played with Miles Davis in the early 1980s. Essentially, you're pulling off from the high B note into an E major triad and then an F major triad. All of these notes are from a favourite Miles scale, the Phrygian Dominant (E F G# A B C D). There are just so many facets to Eric Johnson's style, even before you tackle the phenomenal technique. His clean pop rhythm playing is an encyclopedia of tones and chord voicings. Here are a few ways to decorate a simple chord progression (A B E A B C#m). I used pick and 2 fingers for bars 1-2, then strummed the power chords close to my fretting hand (this gives a crisper sound). Eric also uses a clean Strat tone for more specialised effects. To play the 'harp harmonics' in bars 1 and 2, touch the string 12 frets above the fretted note with your index finger and then pluck the string with your thumb. Pick the regular notes with your 2nd or 3rd finger. For the 'koto' effect in bars 3 and 4, the circled notes aren't actually tapped as normal - fret them with the index finger of your picking hand, and pluck them with your thumb for a twangy tone. Use your fretting hand to bend the strings where necessary. Now turn on the Fuzz Face and let rip! Eric's lead lines often make extensive use of pentatonic scales, but he rarely sticks to the boring old blues box shapes. By working with the full range of the fretboard, he's able to vary his melodies and phrasing much more than you'd expect from the pentatonic (in this example, we're mostly using B minor pentatonic).